Love music and want to test your musical knowledge? Then this app is the one for you! The purpose of this game is that you can test your musical knowledge by attempting to recognize songs by short sound bites. An answer may even be given by voice control when enabled. The game offers you the select up to three genres and the difficulty can be altered by changing the length of the sound bite or the amount of possible answers. The difficulty affects the points you gain by answering questions correctly. Your personal statistics are tracked on your phone as you play, so you can keep track of your overall performance. 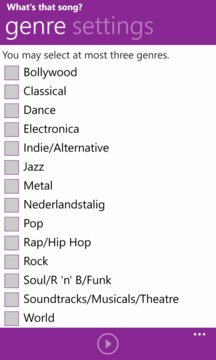 Each music genre has its own statistics. 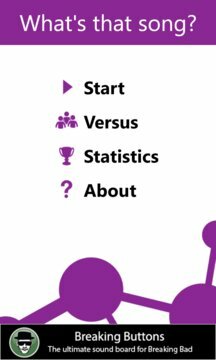 The statistics can be viewed via the Statistics page. You can also challenge a friend with the Versus mode. Versus is a multiplayer match on the same phone, where both players have to guess the same song at the same time. The player who guesses most songs correctly, wins the match.